Ferns are plants that do not produce seeds. They reproduce by spores. They are made of fronds (leaves), which unfurl from fiddleheads. The dominant use of ferns is for interesting foliage in the garden and in the house. Some of the more common indoor ferns are: Mother, Maidenhair, Bird’s Nest, Boston, and Staghorn. While the more common outdoor ferns are: Sword, Painted Lady, Ostrich, Rabbit’s Foot and Tree Fern. The Boston fern is actually an outside fern and suffers from insufficient light when brought inside for the winter. There are also seed plants that are called ferns like, asparagus fern, sweet fern, and air fern. Plants will tolerate cooler temps, but most are frost sensitive. Provide several hours of strong filtered light, by not direct sunlight; it will burn the foliage. To get even growth rotate plants a ¼ turn every few weeks. Most ferns like an acidic soil high in organic matter, but Maidenhair ferns prefer an alkaline soil. Good drainage is imperative. A non-porous pot is preferable to a clay pot. Wire baskets lined with coir are also common. Most ferns are shallow rooted and do not need a deep pot. Ferns flourish in a humid environment, so it is important to increase the humidity around the plant by misting, or sitting the pot on pebbles in a saucer which holds water. Water the soil so that is stays moist, but not dripping wet. Frond yellowing is caused by too much water, and wilting is from lack of water. Since lush foliage is the goal, use a fertilizer high in nitrogen, but feed at half strength, as too much nitrogen causes root burn in many ferns. Feed once a month. Ferns never stop growing, but they need a rest period. In the winter when the light is minimal, slowly decrease watering, and feeding schedule, let the fern dry somewhat between watering and stop fertilizing. To Divide a Fern: Remove from the pot, shake potting soil from roots, and cut the root-ball or rhizome into pieces, each having a frond or two, then plant in small pots. Place pot in a plastic bag, keep the soil moist and keep in a warm shady location. After a month or so, uncover young fern gradually and water very sparingly over the next 3 or four weeks. This gives it time to become accustomed to a less humid atmosphere, or an open room. Ferns are susceptible to the common indoor insect pests . Using pesticides is generally not advised for most ferns. The best solution is prevention. 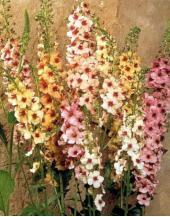 Use a sterile potting soil. There are evergreen ferns like the sword fern, and deciduous ferns. Do not cut back dead foliage until after the new growth has emerged. The dead foliage protects the new shoots. Show as cut or container grown foliage plants. Remove dead leaves and exposed roots, Rhizomes should be unbroken. Cut fronds can be placed in a plastic bag to maintain a humid environment. It is best to experiment with conditioning beforehand. Fronds should be bilaterally symmetrical down the rachis and the pinnae (leaflets) should be filled in uniformly, with no gaps. Container grown plants (Boston fern, Bird’s nest) should have radial symmetry. New growth is beneficial. The plant should be centered in the pot and and should evenly fill the pot without being over crowded. Spores indicate full maturity but need not be present to have a frond to be at the peak of perfection. Spores should not be dried or shedding. Mix 5 tablespoons of all-natural liquid soap with 1 gallon water. Using a hand sprayer apply soap mixture directly on the aphids. 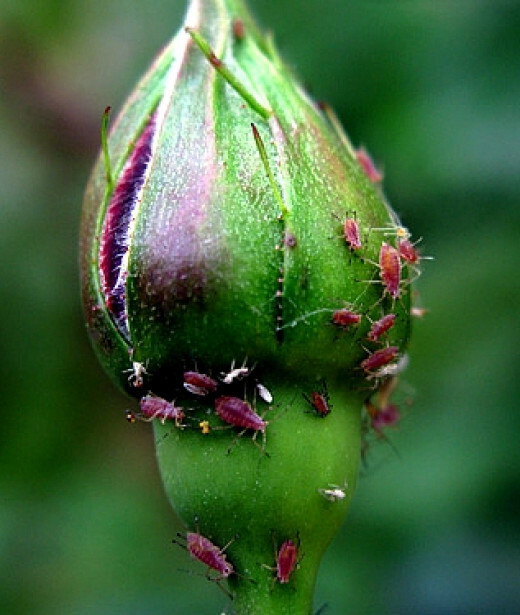 Wait an hour then spray the roses with a garden hose to remove any soap residue and the dead aphids.